Someone once said that the Bible is God’s love letter to us. It’s impossible to be a Christian and not know what it says. Even the illiterate depend on sermons delivered from it. Now, by God’s grace, we can read it in so many different languages and listen to audio versions if perchance we cannot read. The best way to read the Bible is not to read fragments from here and there occasionally. The Bible needs to be read daily and completely, not just once but every year. This post provides seven reasons why you should do so. I shared the foregoing to show that the reasons I’m presenting in this post are authenticated by my personal experience. I’m recommending this because I do it myself and have benefited greatly from it. I have tried to keep the post from becoming unwieldy and I hope you are blessed from reading it. 1. To have a fuller picture of God and his interactions with humanity through the ages: The Bible narrates how the world was created, God regularly sought man’s company, sin broke the relationship and God chose a family through whom His Son would be born as a man. Over time as that family grew into a nation, God spoke to her citizens and others through His prophets; His Son was born to pay the debt for humanity’s sins; He lived, died and resurrected. His followers now continue His ministry of reconciling men to God till His return in glory, etc. “God, who at sundry times and in divers manners spake in time past unto the fathers by the prophets, Hath in these last days spoken unto us by his Son, whom he hath appointed heir of all things, by whom also he made the worlds; Who being the brightness of his glory, and the express image of his person, and upholding all things by the word of his power, when he had by himself purged our sins, sat down on the right hand of the Majesty on high” – Hebrews 1:1-3. The details of this tale of the ages portraying characters, motivations, epic moments and what they all mean for us can only be got through a comprehensive reading. The interpretation is done by the Holy Spirit and because the subject is so vast, what He reveals to us today may not be what He shows us tomorrow. He keeps unveiling deep truths to us as we read and our lifetimes are not even long enough to learn all there is to tap from this story. 2. To develop closeness to God: The Bible is essentially God’s communication to man. Although it has different books wrritten by different authors at different times, it is all inspired by God (2 Timothy 3:16). As you learn a person’s character by reading His writings, so it is with God and the Bible. What makes this more potent is that God is an eternal Spirit (Hebrews 9:14) and He inhabits His word. In fact, He is said to be the same as His word (John 1:1). As we read His word, we interact with His Spirit and get to know Him intimately. This helps us to desire and do His will (Phillipians 2:13). David is a good example here. He often meditated on God’s word. That’s why he knew that anyone who kills the Lord’s anointed will be punished by God, even if the anointed was erring as King Saul was (1 Samuel 26:6-11). In helping us to understand God’s personality and character, reading the Bible through reveals to us what God is passionate about, what He cherishes and what He abhors. We learn, for example, that man’s redemption is His heart cry. He meticulously planned for it for ages after the Fall and considers extending that grace to everyone a priority since the crucifixion and resurrection of Christ. One cannot know God well without falling hopelessly in love with Him. And when that happens, obeying Him becomes a delight, not donkeywork. 3. To improve your ability to hear clearly from Him: If you immerse yourself in God’s word, with time you will easily recognise His voice, whether you are receiving the message audibly; from the Scriptures, the counsel of others, your circumstances or in your heart. God is His word and God is a Spirit as stated earlier. You can identify what He is saying better because you know Him so well and you will know when the message is contradicting His personality or purpose, an indication that someone else is speaking. This what the Lord Jesus was illustrating when He spoke of Himself (the good shepherd) in John, chapter 10. Besides, it is God’s promise that He will speak to you when you draw near to Him and obey Him. The meaning of verse 14 becomes clearer in the following translation. I add the next verse to show greater relevance to human needs. 5. To understand the precepts of your faith and to attain spiritual maturity: We all need to know what is and what is not required of us as believers so that when people try to sell us unsound doctrines, we won’t buy. Besides, if you don’t know what your faith entails, you will keep switching your beliefs according to the latest fads and fancies. That is a sign of spiritual immaturity. I have transposed the verses below to drive home this point. “13. [but that] we all come in the unity of the faith, and of the knowledge of the Son of God, unto a perfect man, unto the measure of the stature of the fulness of Christ” – Ephesians 4:14 & 13 (words in square brackets mine). There are so many things being peddled as part of Christianity whereas they shouldn’t be. For example, the Catholic church has people praying to saints and bowing down to statues. “For there is one God, and one mediator between God and men, the man Christ Jesus” – 1 Timothy 2:5. “Thou shalt not make unto thee any graven image, or any likeness of any thing that is in heaven above, or that is in the earth beneath, or that is in the water under the earth: Thou shalt not bow down thyself to them, nor serve them: for I the Lord thy God am a jealous God, visiting the iniquity of the fathers upon the children unto the third and fourth generation of them that hate me” – Exodus 20:4-5. New churches are constantly springing up, some with dubious motives and making burdensome demands on their members. Folks are fleeced as a condition for obtaining God’s favour; they run from church to church and beyond seeking miracles as though they were the essence of Christianity. You need to settle down and read the Bible for yourself from start to finish, constantly, to be ahead of these scammers and to generally have a stable faith. 6. To be able to preach and teach correctly: You cannot share the word of God effectively if you don’t know it. Yes, you can share your testimony of conversion, like the Samaritan woman. But you need to go beyond that, else when the tough questions begin to be thrown at you, you will draw a blank. A panoramic knowledge of the word is required to defend the faith. Otherwise, people can pull verses out of context to bamboozle you. Now imagine if they pull a verse from a part of the Bible you’ve never read or quote something as scripture that is not even in the Bible like “Heaven helps those who help themselves.” You will be flapping around with nothing concrete to say or concede when you could have built a strong case if you had the knowledge. “But sanctify the Lord God in your hearts: and be ready always to give an answer to every man that asketh you a reason of the hope that is in you with meekness and fear” – 1 Peter 3:15. As you are presenting the gospel to those outside the church, you also need to correct those who might be erring in the church as the Lord leads you. Correction of wrongdoing is vital in the church and we cannot all abdicate that responsibilty on the basis of ignorance or a misguided notion that God’s love is unconditional and only He can judge. The fact that we are all pressing towards perfection does not mean we should watch one another stray without offering some guidance. But it should all be done in meekness. There are so many thorny issues in contemporary Christianity. For example, some are saying it’s okay for a Christian to be gay or transgender, you can have an open marriage, you can identify as a cat or dog. What exactly does the Bible say about such matters? Well, find out. “All scripture is given by inspiration of God, and is profitable for doctrine, for reproof, for correction, for instruction in righteousness” – 2 Timothy 3:16. You see, it’s plainly stated in the last verse above: “All scripture.” You’ve got to read it all, not some of it, and keep doing so. The goal is not to be able to point accusing fingers at others, but to keep learning in order to correct yourself and others as occasion demands. 7. To make your prayers more powerful: God answers our petitions when they are made according to His will, for the most part (1 John 5:14). We need to know His word in and out and constantly revisit it, so that we can pray it back to Him for effective results. The word of God is also the sword of the Spirit. We need to have it all inside us to enable us fight our battles with relevant portions as the Spirit of God stirs them in our hearts. “Wherefore take unto you the whole armour of God, that ye may be able to withstand in the evil day, and having done all, to stand. And take the helmet of salvation, and the sword of the Spirit, which is the word of God: Praying always with all prayer and supplication in the Spirit, and watching thereunto with all perseverance and supplication for all saints” – Ephesians 6:13, 17 & 18. 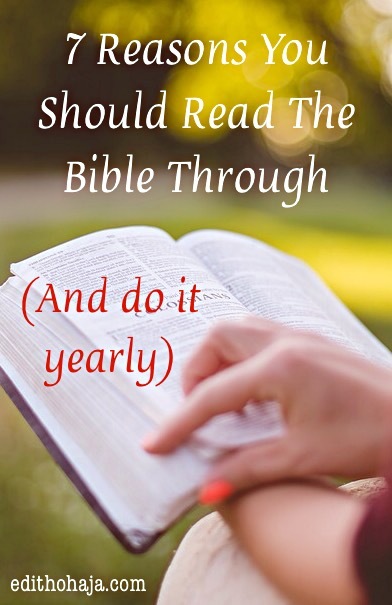 Decide today to begin reading your Bible through yearly. What I did was to make a binding decision on this, a pledge to God. That helps me to stay on track. The flesh is weak and if we leave such an important matter to our feelings and convenience, we’ll never begin or we’ll have a case of fits and starts. Lord, help me to take your word seriously, to read it daily and go through my Bible at least once every year. Help me to do this faithfully without pause for the rest on my life and grant me the grace to live out Your word in all I do in Jesus’ name. Amen. You can also like my Facebook page, Aunty Edith, follow me on Instagram, Twitter (1), Twitter (2), and Pinterest. Plus, you can connect with me on LinkedIn. Jesus is Lord! Praise God and bless you too, Solomon! God bless you too, Brother Sammy! It is well with you in Jesus' name. This is a fantastic message. It's so important to be going through every part of God's word. Not just the little snippets you like or find easier. God's whole message is important to building up a full picture of Him. Thanks for sharing! You're right, Lydia! Thanks a lot for visiting and God's grace in all your endeavours in Jesus' name. You inspire me again, Edith! Thank you, and hugs. That's great, Lucretia! 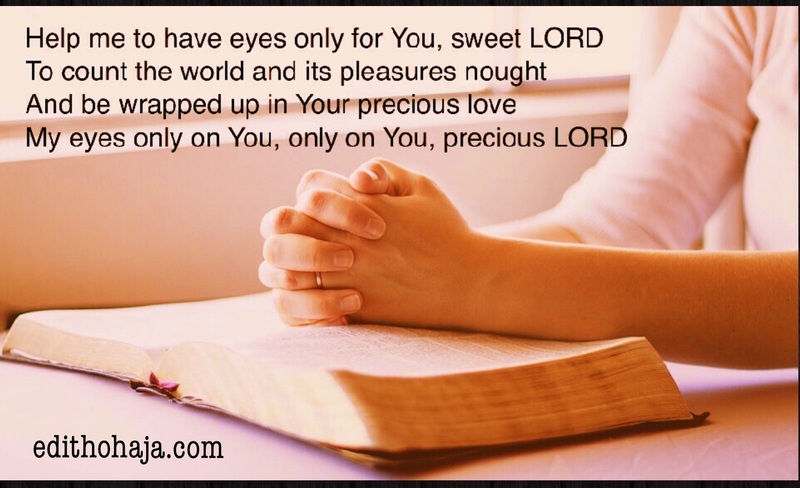 Glory to God and blessings to you, my dear! This has actually been on my mind. I don't think I could read it in a year without missing most of what I'm reading. I do think I could do it in three years. Thanks for the reminder of what I decided to do but never acted on. It's certainly doable, Tami, and it takes your faith to a whole new level. You could stretch it out as you wish though but I won't be surprised if you rapidly increase your ration along the way. It sort of draws you in that way. You are highly blessed in Jesus' name. This is fantastic! Read everyone. 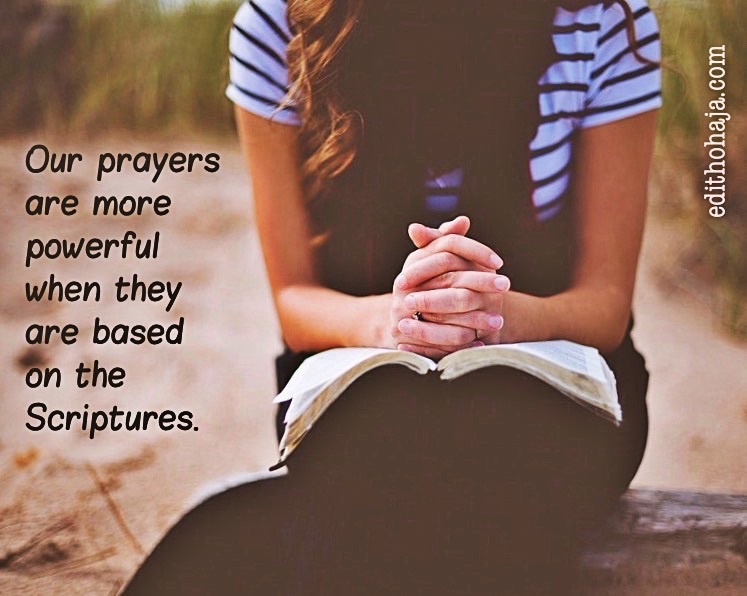 I do think that praying back to God makes your prayers more powerful. Especially for you. Hearing his words in your mouth. True, Tanya! Prayers based on the word of God are definitely the best. God bless you, dear sister! And again, and again, and again..., I hope. Receive grace to do it and favour to meet your needs, Jennifer, in Jesus' name. I totally agree with you. The bible is our life manual. A better operation can only be applied if the manual is properly read and understood. You're right. We make a lot of mistakes without it. Bless you, Ogo! This is absolutely the truth and nothing less! Its not enough that I read it once, I will come back to read through it again to remind myself of the important reasons I need to read my bible. It just cannot be overemphasized. Thanks so much, Ms. Edith! It keeps changing your life as you go through it over and over. May the Lord keep your love for His word fresh in Jesus' name. Lord draw me closer to your word, give me the grace to meditate in it always and forever more. Ur word is a guide in life and I want to be a part of it. Amen. Reading the bible daily helps in our understanding in things which we are confused about. Reading the bible each day gives us a new interpretation of his world. thanks miss Edith for this piece i really appreciate it. The importance mentioned here are not still enough to evaluate the necessity of reading the scriptures. It is all encompassing, more than we can possibly comprehend. Nice one Aunty Edith. A Christian life without the Holy Bible is like a machine without operational manual. Difficult to understand and work with. It's only in the Bible that we find the actual truth of our existence on earth as children of God. Reading the bible can be quite interesting, I gave it a try, I finished the book of Matthew and Revelation but could not go furthe. the little I read helped me, I got so many favours from God and prayers were answered too. Indeed bible is worth reading. it is the best textbook and contain the powerful words for war against principalities and powers. Reading bible as well draws us closer to God. How can you claim to know God and not read the Bible? The Bible is full of knowledge. It sharpens our mind spiritually and helps us foster a stronger relationship with God. This piece is encouraging and interesting. This piece brings back to one of the tools of God's kingdom , helping me with the importance and benefits i gain if only I could apply it daily. Reading the Bible is an essential thing in the life of a Christian. most times I read the Bible before anything else in the morning, because it's fortifying, it gets you ready whatever would come during the day and all. the word of God is life and our life source. God help me not just read but also implement them in my life. The Bible is just the window to the Knowledge of God. It is indispensable tool for education of the Spirit in a Man. Reading the Bible should a Tradition for All Christians. Thank You, Ma. Bible is the road map on earth that will lead us to heaven. It is a unidirectional thing, keep Gods word and you will never get bored about life, the Bible is our guardian angel. It is a builder if persons face. It talks to us in a spiritual form because it is not just a book but a spiritual one. I love the Bible. Thank you ma for this insight, we should learn to read the Bible at all times and not only when it's beneficial to us. Because every chapter in the Bible has a particular lessons and significance that goes with it. When you make the word of God a part of you then there is no way you will go against God because already you have the understanding of his personality and you are aspiring to be like him. Reading the bible is a quality that Christians to imbibe .Because it helps us to have an effective communication with him.It helps us to know ,Cherish and love him better! The bible is definitely a letter of information from God to us. With practical examples and illustrations the bible contains guidelines to life it is a factual and documented well inspired note. The bible is our weapon on the daily war we fight that is the more reason you should get acquainted to it. You are bringing some strange ideas to my ears. But the first part is mixed up. Do clarify. Jesus answered him, "I am the way, the truth, and the life; no one goes to the Father except by me. John 14 vs 6. You don't just accept Christ and don't go beyond knowing the father, you embrace all three in one spirits. Some of our preachers should stretch and breakdown being truly born again and loving the lord thy God. I once met a young man that believed in Jesus Christ but thinks his father was partial and clumsy and I was really touched because of his limited knowledge about God. Ma its just that the bible can come with ambiguous translations and some people get the wrong idea and go about with it. There are so many reasons why we should read the bible, not skimming through it but focusing and meditating on the word of God. Also there are a lot of advantage when reading the bible consistently, we improve our mind about God, we tend to fight and defeat the enemy with just the word of God, God is wonderful therefore we should hear and talk to Him through the bible. looking forward to another interesting write up ma. The benefit of reading the bible cannot be overemphasized. Reading the Bible draws us closer to God and make us understand the way he works.Reading the bible also pave way for spiritual growth. 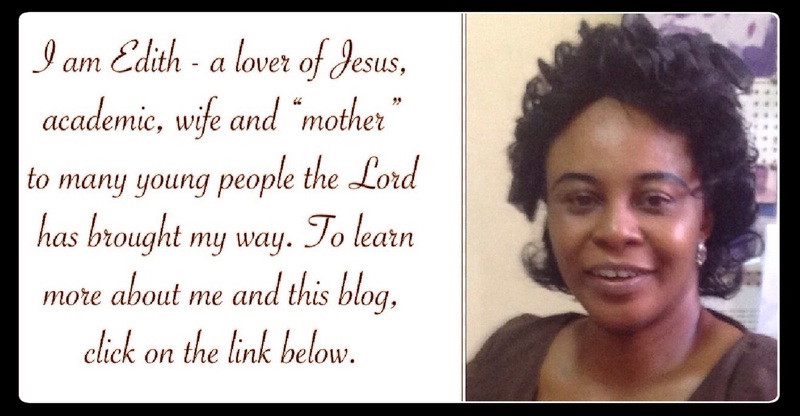 What a wonderful piece ma.i believe this post will broaden the scope of many Christians.Bless u ma. The Bible teaches a whole lot, I think as Christians we should dedicate our time to read the Bible daily and pray for understanding from the Holy Spirit. The word of God is actually the way, the truth and life. For when you get accustomed to reading your Bible always, you find out that whatever situation you find yourself in, you get your answers from one passage or the other from the Bible. That is why it is advised that when we read the Bible we pray for His understanding in order to be able to interprete what we've read correctly. This is very important it has occurred to me several but do to one reason or the other I was unable to finish it , reading the bible is something we can't do without so we have to continue from where we stopped no matter what,the 7 reasons why you should read the Bible is like a write up coming from above , after reading this I felt like I have not been doing the right thing when it comes to praying , I thank God for using someone I know although not well to teach me the ways of the Lord,thank you ma. The word of God is quick and powerful and sharper than a two- edged sword. It is capable of cutting both soul and spirit, between joints and marrow. It is the discerner of the thoughts and intents of the heart. The word of God should be paramount to a child of God. A child of God should not just read the word but should meditate on it and esteem it highly. In that way, it will reflect in his/her life. It's very important to study God's word and understand what it says. By so doing, we'll be able to defend our faith and back up our actions with God's word. It also draws us closer to God and makes our faith in him stronger. Most importantly, i love the 5th point which entails understanding our faith better. This way, we'll avoid misconceptions and false information which are not in line with God's word. Good lesson learnt. Thank you for the advice and tips. The bible shapens our belief, and constitutes our life to be morally principled, it is indeed necessary to read the bible to know more of our creator and the reasons for everything. My bible is my weapon.. So reading it every day is something I don't forget to do..
To grow more spiritually in Christ, you need to read your bible. let His words find an expression in you. That you may meditate on His word day and night. His word is a Landmark, path and a guide to users. Reading and assimilating the bibble is a very important quality modern christians should cultivate...I pray God grants me enough faith and strength to read the bibble.